It's that time... The time when we need to start thinking about what we're buying our loved ones for Christmas and perhaps what we want to pop on our own wish lists... Today I'm talking through the very best beauty and lifestyle stocking-fillers and Christmas gift sets that come in under £30. I hope this gives you some inspiration! Prezzybox do pretty much every gift you can think of, no matter who you're buying for. What I really like about their website is that they do personalised gifts at a really affordable price-point and the layout makes it so easy to find something perfect for your loved ones. 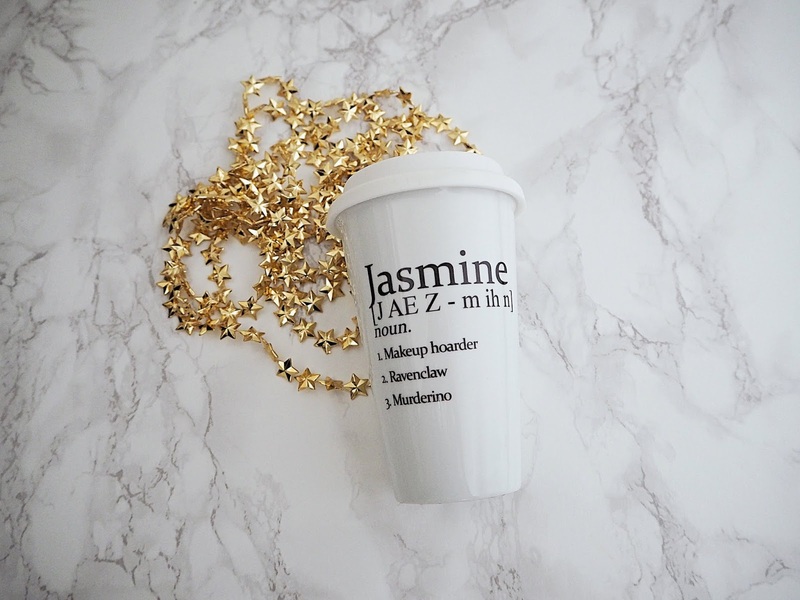 Personalised Ceramic Travel Mug* | £14.99 | I absolutely love this! It's a ceramic mug you can use on the go and you can put the person's name on it as well as three little 'definitions' underneath. I think this is so cute and personal; you can make whatever in-jokes you want so it makes them laugh but it's still something functional they'll actually get a lot of use out of. Zoeva is an affordable, high-quality brand and this year they've gone travel-sized! This means they have some perfect little makeup stocking-fillers that are so good but won't break the bank (they also have some amazing themed sets around each of these palettes that are a little more expensive but still excellent value considering the price of the individual products). 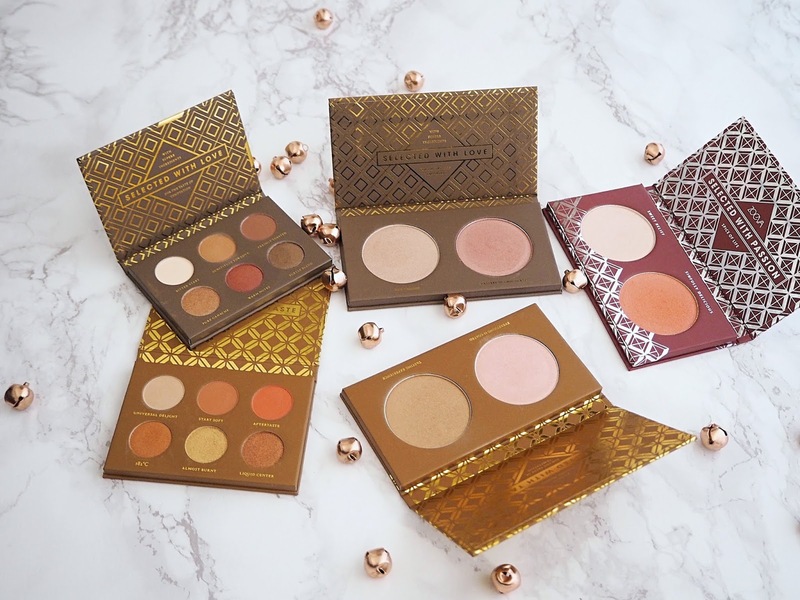 Zoeva Plaisir Highlight Palettes* | £11.50 each (or £31 for all 3) | full review & swatches | First we'll talk about one of this year's gift set. This is a collection of three glowing cheek duos that are themed to pair up with their eyeshadow palettes. I really like this idea and I think that fans of the eyeshadow palettes will love these. The formula is so pretty; it gives a stunning, soft glow without being too crazy-intense. There's Cocoa Blend, which contains a champagne and a rose colour, Caramel Melange, with a champagne-pink and a golden bronze, and Spice of Life, with a frosty gold and pinky-berry. Due to a bit of a scheduling change my review of this is actually up this Thursday, so I'll link that when it's live. Zoeva Voyager Eyeshadow Palettes* | £12 | full review & swatches | There are now four of these palettes and the formula is so easy to work with and the pigmentation is lovely! Cocoa Blend is a gorgeous selection of warm-toned browns, golds and bronzes but also has that pop of cranberry. Caramel Melange is more of your super-warm coppers and reddish-browns. Lush is always a great shout for Christmas if you know someone who loves relaxing bathtimes. Their prices have definitely gone up recently, however you can still nab these mini shower gels at a stocking-filler cost. Lush Shower Gels: Sleepy, Cinders & Snow Fairy | £5.95 each | These are super cute little ways of sampling the Lush shower gels and if the person receiving really loves one of the scents, they can always pick up one of those huge bottles in the Boxing Day sales! Sleepy is great for the person who loves to relax and unwind; it contains sweet tonka along with lavender to de-stress. Cinders is the more spicy, orange-scented, super-moisturising festive option. Snow Fairy is the classic super-sweet, super-pink 'candy in glittery shower gel form' for the true fans who have to have a bottle of the stuff every year! Comfort Zone do amazing facial skincare and body products. I personally love their Tranquility range - for Christmas last year I got their mini set and my mum got the big deluxe version. I find their products so underrated and if you know someone who loves creating that 'spa at home' vibe; definitely give their product range a look. 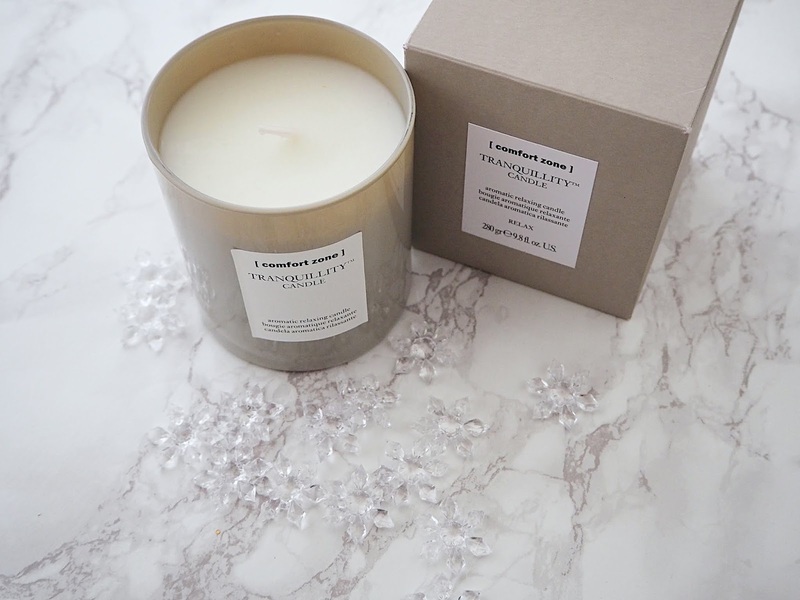 Comfort Zone Tranquility Candle | £25 | This is one of my all-time favourite candles; I've both bought it for myself and been bought it! It has such a soft, unique scent that still really fills the room; I'd be very happy if my entire house just had this scent all the time... The notes include sweet orange, floral and cedarwood. Caudalie is one of my favourite skincare brands of all time and they make some pretty amazing body products too. All of their products are centred around their hydrating grape water and these sets are such good value for money. A good few of these are absolute staples in my routine and gifting them to other people is a great way to spread the word about the products you love! Caudalie Beauty Elixir Bauble* | £12 | This product is a Caudalie classic and this Christmas you can get it in a cute decoration for the exact same price! This comes in at a purse-friendly £12 so is great for established fans (this bottle is small enough to take on flights or throw in your handbag) or if you swear by it and you want to share it with someone else you think could love it as much as you do. This is a face mist that has the most amazing fragrance and contains ingredients like rosewater, grape extract and peppermint oil to refresh and hydrate the skin. Caudalie Luxury Vine Body Butter Set* | £22 | I think I had a similar Caudalie gift set a couple of Christmases ago (possibly with the lip balm too) and I really was a fan of both these products. If you read this blog regularly, you'll know this hand cream is probably my favourite of all time. I love the light grape scent, the lasting hydration it gives and the fact it's not slippery at all on the skin. The body butter comes in the same scent and instead of having a thick, heavy formula, this one is lightweight and whipped. It feels lovely and leaves my skin so soft. This is in the same gorgeous scent as the hand cream. 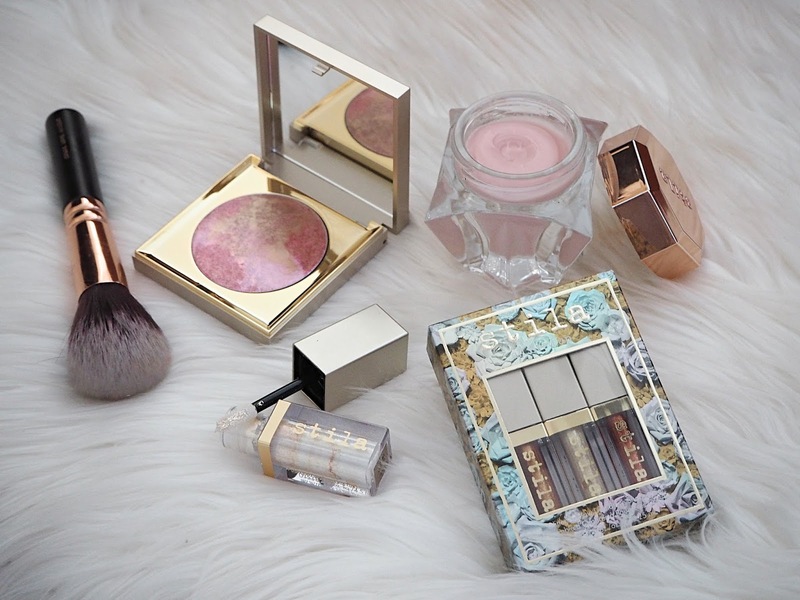 These give someone a bit of luxury without breaking the bank and I really do love passing on my favourite products to the people I love by buying them gift sets like this. Caudalie Natural Hydration Heroes Set* | £29 | full reviews | This set is such good value! You get the full-sized serum in here, a proper bottle of the Grape Water and the mini of the Hydrating Sorbet. As the serum retails for £29 alone you're essentially getting two extra products for free with this set. I recently reviewed the serum, so if my post made you want to pick it up, I definitely recommend getting this. I love the serum so much; it's hydrating, plumping and softening whilst having a lightweight formula, which my combination skin loves! The Sorbet is a lightweight moisturiser that practically melts into the skin, giving that fresh boost of hydration. I also am a big fan of the Grape Water; it's 100% just that ingredient in a spray mist. Caudalie grow these grapes themselves and this water is created from them. It's so hydrating and gives dry winter skin some much-needed relief. I always have a bottle of the stuff in my personal collection. 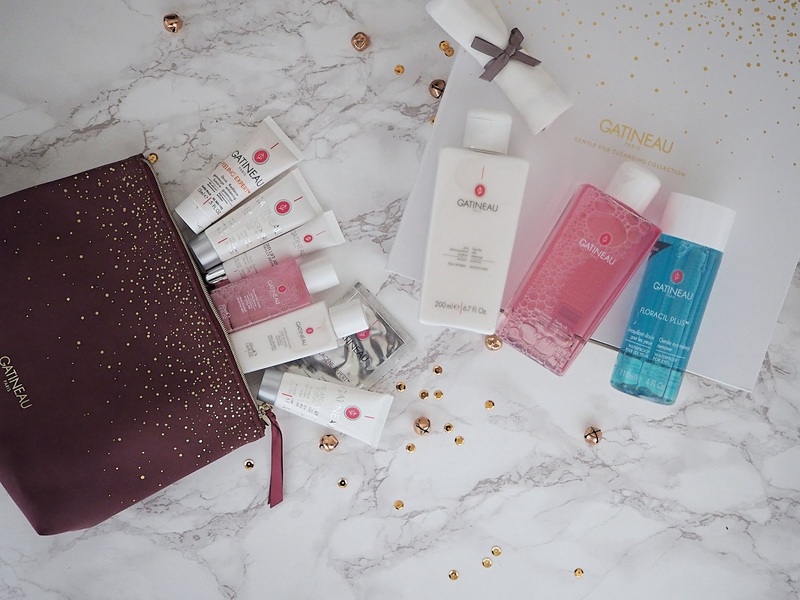 Gatineau is definitely more on the luxury side of things but they have some skincare gift sets this year that come in at under £30, so you can give someone the opportunity to try out several of their products and they can decide what they might want to purchase the full size of. Gatineau Gentle Silk Cleansing Collection* | £25 | This has to be one of the best value skincare gift sets on the market this year! You get three products in here that, whilst half the size of the standard bottles Gatineau sell, still look very much like full-sized bottles to me, along with a face cloth. I really am a fan of this cleanser; it feels gorgeous on the skin (which you'd hope, as it's actually formulated with silk extract, along with cotton and sweet almond oil) and can be used as a second / morning cleanse or to remove lighter makeup for soft, hydrated skin. The eye makeup remover is also a product of theirs that I'm familiar with. Although I don't use something like this on an everyday basis; I do reach for it when I need my makeup off fast without faffing around with oils and face cloths. That makes it pretty perfect for late nights during party season... Finally we have a new product to me; the Gentle Silk toner. I've only used this a handful of times but so far, so good! It has the same key ingredients as the cleanser and is nice and hydrating on my skin, plus smells so fresh and clean. I really like that this gives a full 'bathroom skincare' routine and the bottles are massive for this sort of set, making it such a good deal. Gatineau Little Luxuries Christmas Collection 2018* | £29 | I was definitely a little confused by the price of this compared to the cleansing collection as these are minis, however I do appreciate you get a really good-quality pouch with this and the original price-point of a lot of these products is quite high. It's a good way to introduce someone to this brand because you get to try a bit of everything. You get a mini Silk Cleanser and Toner in this set. You also get the incredible Radiance-Enhancer glow-boosting express acid exfoliation treatment in here (I reviewed that here). Another highlight is the Anti-Wrinkle Radiance Mask - you can either put on a thick layer, leave it for 10 minutes and rinse it off, or I personally use a little less and leave it on overnight for soft, smooth, hydrated, plumped skin. I haven't had a chance to fully test out the Probiotics Cream just yet but if you'd like me to review it at a later date; do let me know. The Smoothing Eye Pads with collagen make me look so much fresher and more awake - perfect for party season! I've tried the Lip Care in here before; it wasn't to my personal preference but if you want something a little more glossy and to get a smoother effect with your lip care, you may enjoy it. All in all it's a great overview of the brand. TIGI have a few hair care sets out this year and if you know someone who's a fan of their products, I definitely recommend checking these out because they're such good value compared to buying each product individually. 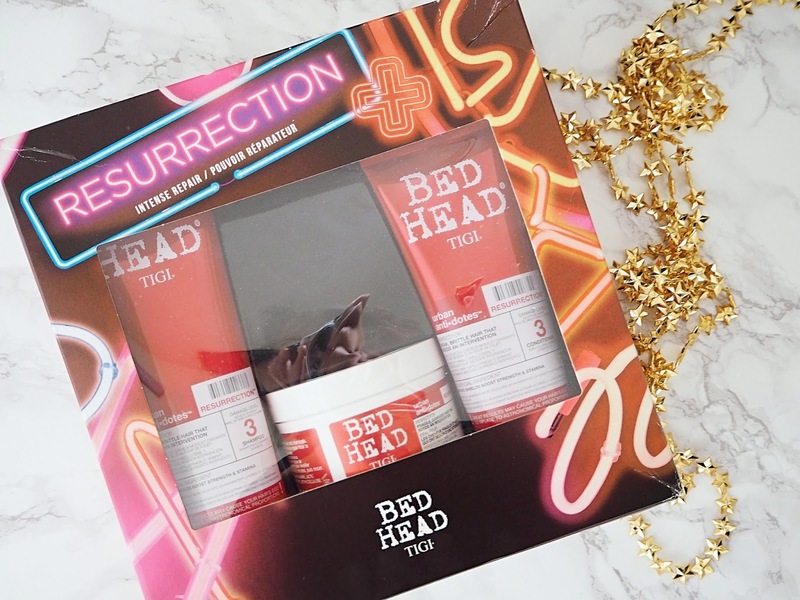 TIGI Bed Head Resurrection Gift Set* | £23.99 | This range is an old favourite of mine; it's great for dry and damaged hair that's in need of some nourishment. The shampoo won't strip your hair and the conditioner is incredibly smoothing, but at the same time doesn't make my hair greasy. The hair mask is a new discovery for me and probably my standout. I'm really impressed with how much healthier my hair has been looking since I started using this! I even had straight men give me unprompted hair compliments the first time I tried it. I can definitely see this being a staple in my routine. All of the products in this set smell great too. Huda's eyeshadow palettes can get pretty 'up there' in price but she does these mini Obsessions palettes that come at a much more affordable cost. 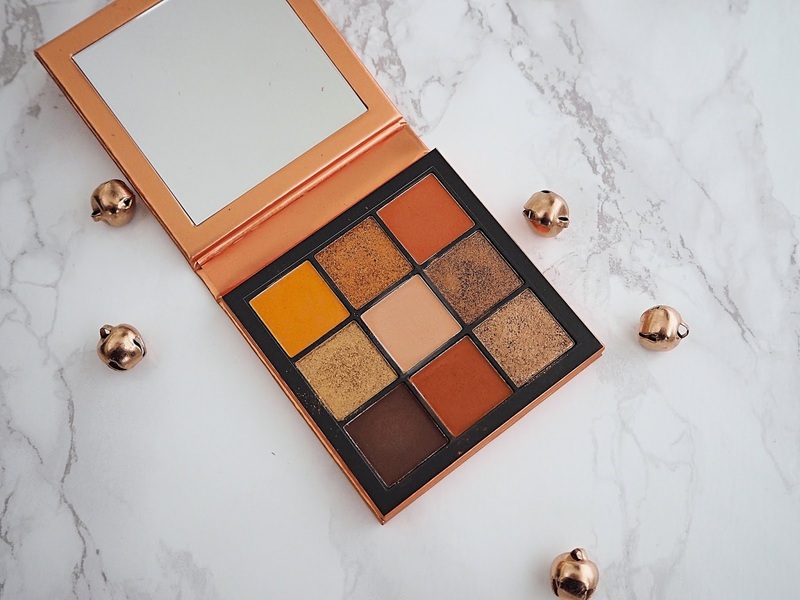 Obviously some people will want her large palettes as their only Christmas present or as one of a small handful, however if you know someone who'd love to try this formula but you don't want to break the bank; these palettes are perfect! Huda Beauty Topaz Obsessions Eyeshadow Palette* | £25 | full review & swatches | This latest batch of mini palettes from Huda are all themed around precious stones; this is the most neutral of the bunch but they have pinks, purples, greens and blues, all with really strong colour stories. I love the formula and consistency of these shades; they're definitely easier to work with than her full-sized palettes, which is much better if you're buying for someone who might not be super into makeup and wants something they can use without needing to know specific techniques. This is a gorgeous selection of warm orange and brown tones, with a really good gradient to the shades and a nice mix of mattes and shimmers. Molton Brown's festive offerings vary from super-fancy gift sets to smaller items that are a little more purse-friendly. Here I have this year's take on Christmas; Muddled Plum. 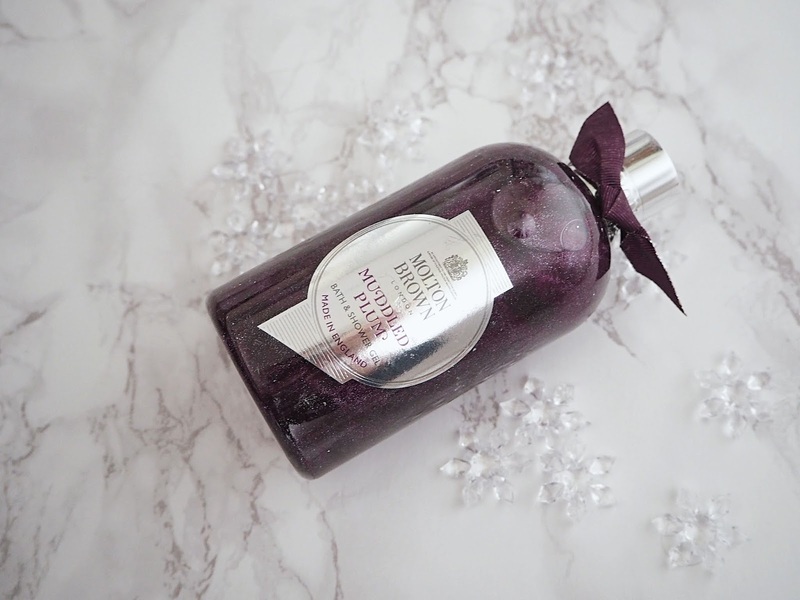 Molton Brown Muddled Plum Bath & Shower Gel* | £24 | This scent is Christmas in a bottle for me! I also love the design of this with the festive silver glitter sprinkled throughout the bottle. It contains notes of plum, orange, rum, saffron, sandalwood and more, creating a warm, sweet, very seasonally-appropriate scent. I love using this as a shower gel but you can also pop a little into your bathtub and it creates some serious bubbles! I don't think I've ever been disappointed with a product I've tried from Merumaya, making it perfect for gifting. They do a bunch of skincare sets for Christmas, depending on your skin type, with a mix of both full-sized products and minis. Merumaya Great Skin Starter Set* | £29.50 | I have their Great Skin set here, which is just a good place to start with this brand! In here you get a decent-sized mini of the Melting Cleansing Balm, a little sample of the Gentle Exfoliating Toner and a mini Youth Preservation Moisturiser with SPF20. I do want to try the moisturiser for a little longer before I deliver my verdict but so far it's really nourishing and softening, so will be great if you have dry or mature skin. I've actually emptied a full size of this toner before and really like it! If your skin is a little more sensitive but you want an AHA toner that's going to give you brighter, smoother skin then I recommend giving this a go (my full review can be found here). I would definitely pick up a full size of the cleansing balm, as I've not tried a product like this that comes in such convenient packaging! It has this really nice gel-balm consistency, so if you don't like the feel of something that's quite oily to remove your makeup with; it's a great place to start. It doesn't sting my eyes, has a luxurious feel on the skin and (most important of all) really works, even on stubborn makeup. Although the products are geared more towards anti-aging, this little introductory set can work for anyone whose main skin concerns are dryness and dullness. I'm sure you've probably come across Ecotools if you're a makeup-lover! They're an affordable vegan and cruelty-free makeup brush brand, making their sets perfect little stocking-fillers, especially for beauty fans who are conscious of these issues. 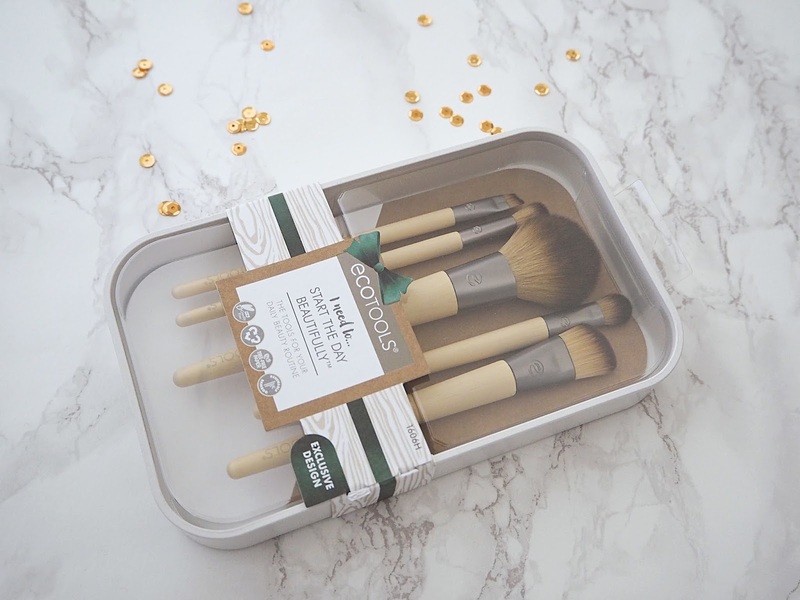 Ecotools Start the Day Beautifully* | £12.99 | This is a great little starter kit for younger people or those just getting into makeup if you don't want to break the bank. I really like Ecotools brushes; there are definitely a fair few that are in my 'every single day' brush rotation and they really last and wash well, despite the low cost. You get a little angled brush, which can be used for gel liner but also for your eyebrows. You get a nice blending brush that makes applying eyeshadow so easy. There's a large powder brush that you can use to set the face or for blusher / bronzer. There's also a flat brush that you can use for concealer or as a base eyeshadow brush. Then finally there's a flat angled face brush that you can use to apply foundation or even your contour. This also comes with a handy little storage tray. Fresh Beauty is a skincare, body and fragrance brand I truly love! Their tinted lip balms are some of my favourites so I definitely recommend checking out the gift packs they have (there are also some for their face masks). 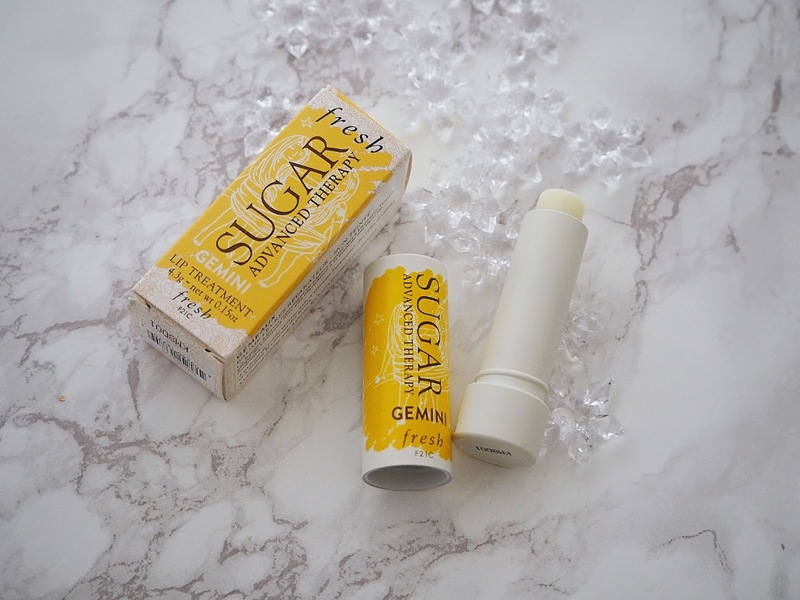 Fresh Beauty Zodiac Sugar Lip Treatment* | £21.50 | On the more affordable side, we have one of my all-time favourite lip care products with a personalised twist! It's so nourishing and smoothing for my lips and I love the brown sugar scent it has. I'm a Gemini, so my packaging is yellow but each comes in a different colour with the Zodiac sign in the background and I think this design is so pretty! 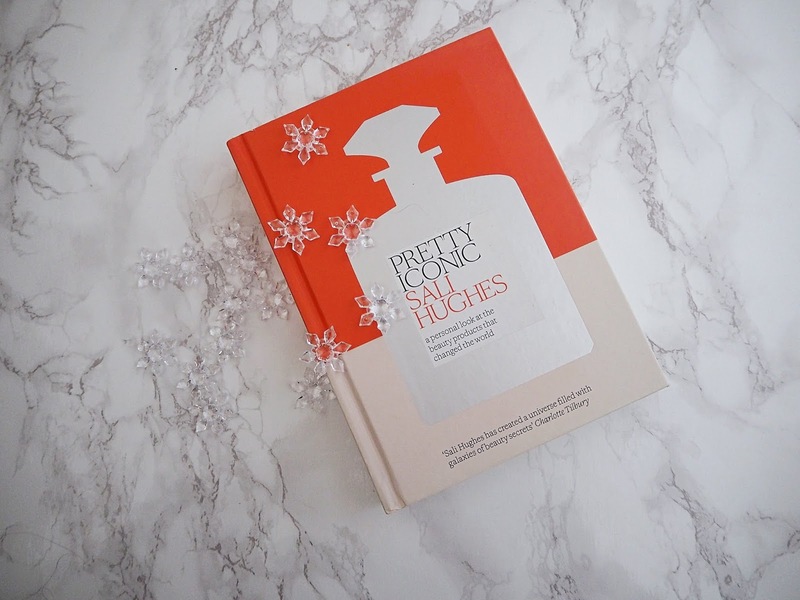 Pretty Iconic by Sali Hughes | £26 | I absolutely loved Guardian beauty columnist Sali Hughes' debut book Pretty Honest (I reviewed it here) and am also a huge fan of its follow-up; Pretty Iconic. 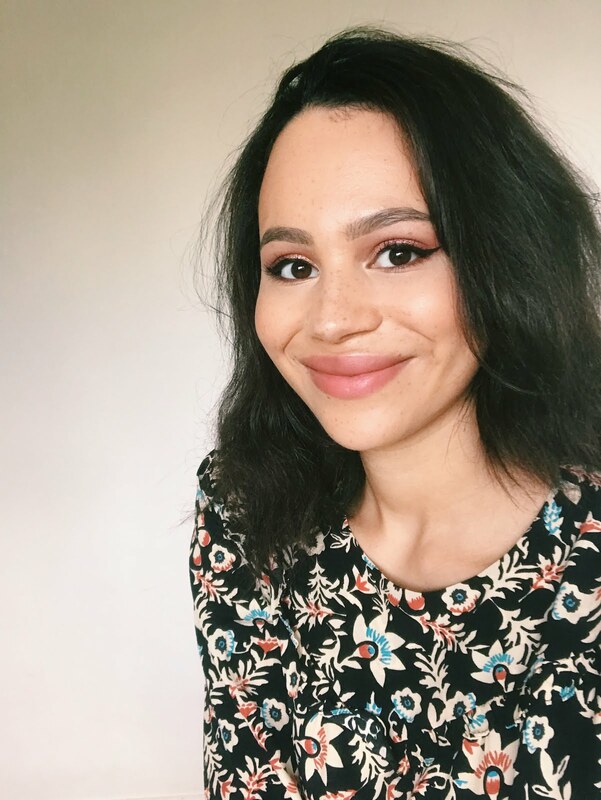 This is a look at some of the most iconic beauty products of all time through Sali's personal stories and, of course, is peppered with her signature wit. I can't recommend this enough as a gift for beauty enthusiasts. 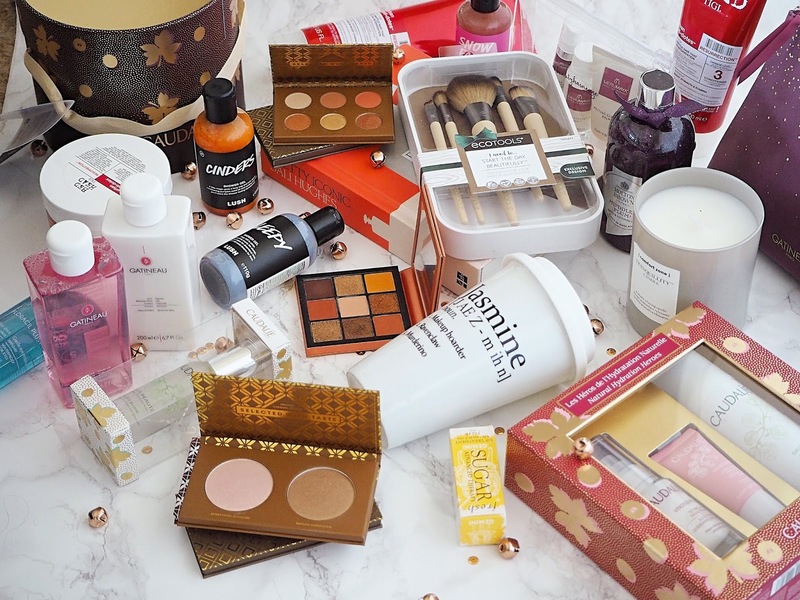 Which affordable gift sets and stocking-fillers have you been impressed with this year?